A devastating fire in 1987 left the Kerr Mill in Fall River in ruins. 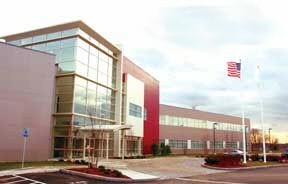 The city hired The Keefe Company in 1996 to develop a strategy for the reuse of the 33-acre site, at a strategic location adjacent to Routes 6, 24, and I-195. UMass-Dartmouth faculty and staff will occupy half of the building, while the rest will be leased to private companies conducting research, development and engineering. The center's first private tenants, three technology start-up firms, moved into the center during 2002. MassDevelopment, the states quasi-public economic development agency, managed and financed the 14-month construction of the ATMC, and owns the building and the future 200,000 square foot South Coast Research and Technology Park, expected to create 600 new jobs, including the ATMC. Parcels adjacent to the center are now ready for development. According to Robert S. Karam, a Fall River businees leader and former chair of the UMass Board of Trustees, "the benefits of this project grow with each and every day. Frank Keefe's long-term dedication to the revitalization of Fall River, starting with a Heritage Park back in the 70s, is greatly appreciated in Fall River."